Every hour of every day, the CIW organizes in two very different worlds: In the farmworker community, and, for lack of a better term, in the outside world. They are two very distinct spheres of activity — with distinct organizing styles, strategies, tools, languages, and objectives — and rarely do they meet, usually intersecting only during the major annual actions when large numbers of CIW members and Fair Food allies come together for an extended period of living and organizing side by side. This website is almost exclusively an organizing tool of the “outside world,” where we share news and analysis of the Campaign for Fair Food in a language and a style aimed at the vast and growing network of Fair Food allies across the country, and even overseas (we’re talking to you, Ahold!…). 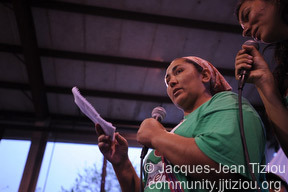 But today, those two worlds come beautifully together in a letter — two letters, actually — penned by CIW member Carmen Esquivel (shown here, above, speaking at the rally following April’s huge Farmworker Freedom March in Lakeland). “… Together with the CIW we have been here knocking on your door for months. You haven’t heard us or paid us any attention. It seems you must think us so insignificant and so inferior that sometimes it seems that until we reach our divine justice we’ll be divided in society. But despite the immense sacrifices and our protests for liberty in which entire communities have been witness to our struggle, you still haven’t seen us. Doña Carmen’s letter is a inspiring confluence of the CIW’s two worlds, so much so that we were moved to share it with you today in its entirety. Click here to see the letters in full. We hope you, too, are inspired by their words for the battle that lies ahead.